Media Access Control (MAC) address is a unique identifier assigned to each network adapter. It is possible to set up your Linksys router to allow or prevent access to the network for up to 32 wireless devices using this unique identifier. This article will guide you in enabling the Wireless MAC Filter feature of your Linksys Wireless-N router. IMPORTANT: Select which devices should not have access to the network and list down MAC Addresses of their wireless adapters. For instructions, click here. QUICK TIP: Once you have decided which wireless devices should be able to connect to the network, have these devices connect to the network and disconnect the ones that should not be able to connect to the network. This will do away with the task of manually retrieving the MAC Address of your wireless devices. NOTE: To launch Linksys Connect using a Windows® computer, go to Start > All Programs > Linksys Connect. To launch Linksys Connect on a Mac® computer, navigate to the Applications folder in Go, and then start Linksys Connect. Under Other options, select Advanced settings. Click Copy password then click OK.
Click Enabled for Wireless MAC Filter, and then select Permit PCs listed below from accessing the wireless network for Access Restriction. NOTE: Select Prevent PCs listed below from accessing the wireless network in case you prefer to prevent the PCs on the list from accessing your wireless network. Click Wireless Client List to register the MAC Address of the devices that are already connected to your wireless network. NOTE: To learn how to find the MAC Address of your wireless device, click here. 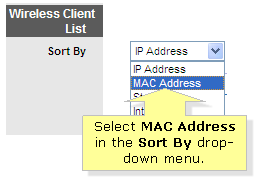 On the Wireless Client List window, select MAC Address in the Sort By drop-down menu and enter the necessary information in the available fields. Once done, click Add. You should have successfully enabled Wireless MAC Filter on your Linksys Wireless-N router now.